Great albumin hindsight. This album turned me off a little when new and due to it being a give the people what they want LP - it wasn't anything NEW new - but treading similar ground to past endeavors. DO NOT SLEEP ON THE BONUS CD. It's a key part of this particular version of the release. Bought it when it dropped on wax (+bonus CD) - nice packaging...didn't lock onto any tunes to play out but at the time...then I rediscovered it and played it loud on a system setting up at a gig and now I'm glad to have this often-written-off gem in my repertoire. Give it a whirl or revisit through a decent system with the volume up a bit. Proud owner. Interregnums is the thing to check out. No crazy edits and stuff but the lush and chill orchestrations and such. I this release much more now than when it was released - out of context and with bonus CD. mist and melodic flourishes, as with the twinkling of "Beaten Thursdays" or the quasi-jazz that starts off "Aborted Hugs" before it shifts into warmth. The warmth extends onto the sunny mist of "Girlfriend Boyfriend," while "Prog Version Slowly Crushed" offers more grandeur. "Noreaster Cheer" brings in a touch of easy listening, and "Let It Ring" gets back to more hip-hop. 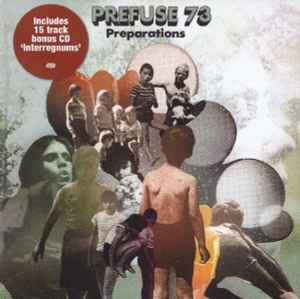 A twinge of folksiness dances around the beats of "I Knew You Were Gonna Go," The assemblage of "Spaced + Dissonant" has a sweetness to it before the thrumming of "Preparation Outro Version" brings the first disc to a close. But the strongest track here has to be the collaboration with School of 7 Bells, "The Class Of 73 Bells." Essentially a remix their "iamundernodisguise," the track becomes blend of ethereal folk, harmonic vocals and beats is quite irresistible. On the INTERREGNUMS disc, he shows off his more orchestral side, as "For Her Non-Place" pours on the melancholy with its piano and string combination, while the more spacious "Thorough Light" drifts in as if from a soundtrack. "Spacious And Dissonant Part 2" brings in the chorus, and "Pitu" the long sweeping vistas. "Over Ensembles" swells with the strings, and "The Last" is all about the bliss. "Sunbeamstress" could have been an early Savath + Savales track, while "The Ground We Lift" takes a page out of Tim Hecker. "Let It Ring Ensembles" is a haunting composition, and "Prepared As It Was" closes out the album with another choral ensemble. Prepare yourself!